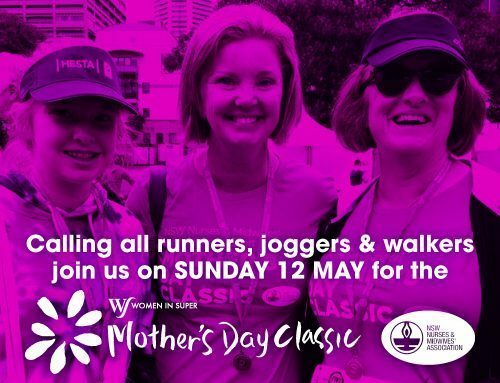 The Mother’s Day Classic, on 12 May, is a national fun run raising money for the National Breast Cancer Foundation. The NSWNMA will be showing its support by once again sponsoring the water stations at The Domain and Parramatta Park, Western Sydney and by entering an NSWNMA Team. You can come along and be part of the team by volunteering to hand out water and refreshments on the day at The Domain or Parramatta Park events or by joining the NSW Nurses & Midwives’ Association team as we make our way around The Domain, Parramatta Park or any of the events held across NSW. We would love to see as many members and their families join our team either running, walking or volunteering at the water stations. Register and nominate the NSWNMA as your team. • Search and select our team name – NSW Nurses & Midwives’ Association using team password NSWNMA if prompted. If you can volunteer to hand out water and refreshments on the day at the Domain and Parramatta events, please contact Miriam Galea at events@nswnma.asn.au.